Hello, and welcome to the Hero Arts 2014 Catalog Blog Hop. I have two cards to share with you today… AND news of giveaways a-plenty! First up, a card featuring the new Nicest Thoughts stamp. I love this one… For my card, I stamped the image onto some patterned paper from THIS pad and added a tiny stamped butterfly from the new Butterfly set set. I added Rock Candy Stickles and Glitter to the sentiment, and a tiny gemstone too. The butterfly paper is from THIS cool pad. I love the soft sparkle effect of Rock Candy Glitter… it's so pretty. 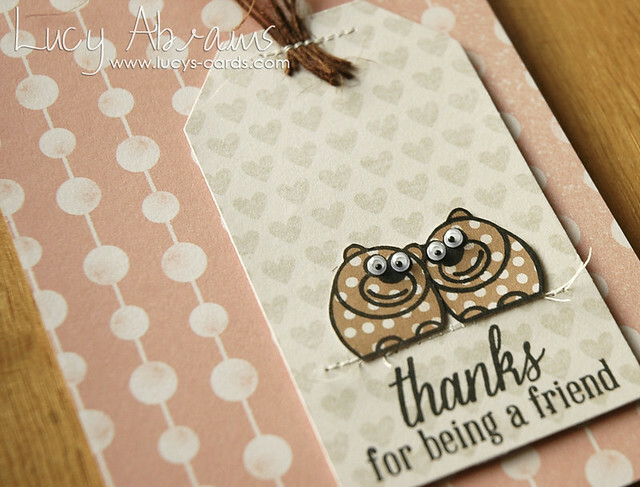 For this card, I used an adorable bear image from the Lil Hoot set. 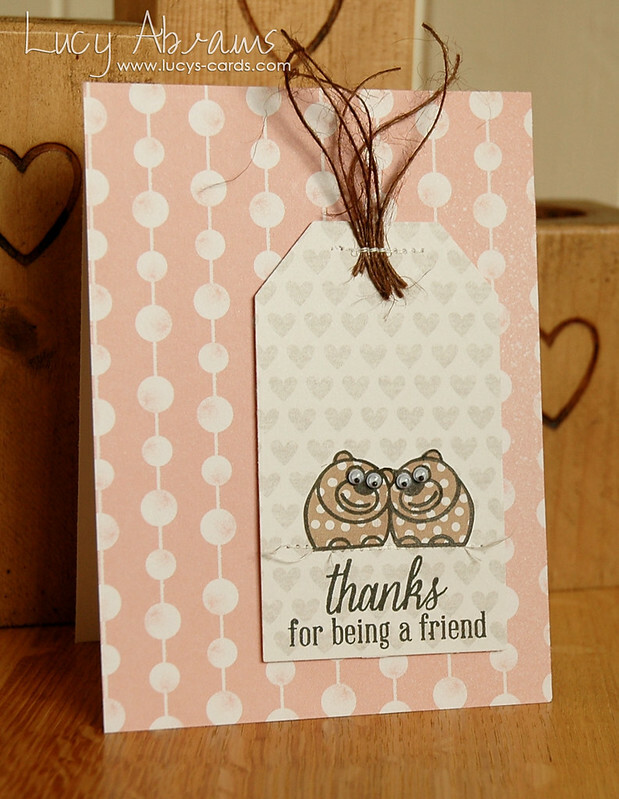 To create a mirror image, I stamped the bear onto an acrylic block, then again onto the polka dot paper. I used a black fineliner pen to fill in the missing bits and voila - a cute pair of snuggly little bears! The sentiment is from the gorgeous and oh-so-useful Enjoy Today set and the patterned papers are from THIS and THIS pad. And what cutsie card would be complete without some tiny wiggle eyes??? Now it's time to hop on… and your next stop is the incredibly talented Cristina Kowalczyk. Oh, and remember, if you find a link that doesn't work, hop back to the Hero Arts blog for a full list of blogs on the hop. I love the cute little bears on that paper. Such a clever way to make them look paper pieced. The colors are great together. I love your card especially the Little Hoot set. I love the Little Hoot set card the best. Great job. The butterfly card is just gorgeous and the bear on is adorable! These cards are adorable! The butterfly background is awesome and I love the softness of both cards. Your cards are happy. I love the hearts!!!!!!!!!! The rock candy glitter adds a great touch to the card. very pretty! Your cards are lovely, especially the butterflies. The sentiment is really good. Both are very pretty, I especially like the first one. Love the softness of the butterfly card! Beautiful cards! Love how you did the mirror image! So cute! love the backround of both cards. Both of these are great! Love! omgosh, so cute! thanks for reminding me to stamp on patterned paper! Love the tiny bit of sewing you added as embellishment, Lucy. TFS! Love your cards. Neat idea on how to get a mirror image. Love these cards, Lucy!! This release is filled with something for everyone. The "nicest thoughts" stamp has to be one of my new favorite sentiment stamps! Great cards! Love those bears! This set is definitely on my must have list! I reall love the butterfly background. You did a fantastic job. a beautiful card and I like butterflies! Both are great! The tecnique on the first one is cool, the cuddling bears though captured my heart!! Love how the fiber is sewn on and the wiggle eyes finish the card off so well!! I love butterflies and this card is awesome! Love the cute polka dot bears. Love both of your cards. Thanks for sharing. Super cute cards, love the stamping on the background paper! sweet cards. Thanks for sharing. Your cards are so pretty. Love those pattern papers and those bears are so adorable. The cards are so pretty. Love the butterfly paper. You make the loveliest cards and the colors are so soft and gorgeous too!! Love both your cards--but have to say I'm just gushing over the wiggly eyes and cutie pie bears! Both are so cute. Love that butterfly paper and the cute little butterfly you added to the sentiment stamp. Cute cards! I like your use of patterned paper. As always, your cards are amazing, Lucy! I love all the sparkle on the first one and your stitching is fabulous on the 2nd card! I am just in love with the stamp you used on the first card! I love the soft look of the butterflies too! Soft and sweet! Love both of them! ah...I just love your cards! Everything is better with wiggle eyes! Thanks for sharing. I love the butterfly background! Great cards and great color! I love the raised sentiment - this one is a must have! Super cards! Love the way you used the patterned paper and stitching. Nice cards. Love the soft colors with the Lil Hoot set. Both so pretty! I wish i could use pattern paper that artfully! so smart to stamp on pattern paper for the bears! save time on coloring ! Love both of your cards, but those cute little bears with the googly eyes stole my heart!!! Thanks for the inspiration! love how blingy the rock candy glitter works! just toooo cute! I just totally love the first Card - the colours, syle - everything!! Lucy you are the queen of cute! Beautiful cards!! Love your style. Both cards are gorgeous but I particularly love the cute polka dotted bears. How pretty for both cards. I love the butterfly background. The first card is just lovely - love the ribbon treatment. The second card is just adorable!! So very cute! And thanks for the reminder on how to flip an image. I need to do that. Youre cards are so girly-cute! Love it! That paper you used for the first card was just perfect!! Your cards are so darling and precious. Love the raffia just the perfect touch. You really did a great job with your stamping. Love what you did and how you did it. Love your thanks for being a friend card!!! good job!!!! Both cards are delightful, Lucy! Dawn Y. Both lovely cards. I like the sentiment stamps and the rock candy you used. Those lil bears are so cute and I like their real eyes. Too cute. Beautiful background paper also. Thank you for sharing you're great ideas. Thanks for sharing your great cards! Happy Holidays! Lucy, I am loving these darling cards. Thanks for the inspiration! Beautiful cards! Love the stamp sets that you used, they matched perfectly with the patterned paper! Great cards, love all the new products so far. Lucy, love both cards, your colour choices are just perfect. Adorable cards, Lucy! Love that first one with the butterfly background paper. That sentiment stamp is a must have! Great cards, Lucy! Love all the new stamps! Nice cards! I like the stitched threads on the tag, and the little butterfly on the sentiment. Lucy...your cards are so cute and I really like the look of the Nicest Thoughts stamp stamped onto pattern paper! They are both really lovely cards. I love the glitter there. So much pretty pink...love it. so is that bear hair on top of the tag? Great cards! Love the snugly bears! I love your background stamps, and what darling cards you made from these wonderful stamps. Those two cards are so soft and pretty! Cute cards. I love the butterfly background you created! Such nice cards! I luv the card with the use of rock glitter!!! Great projects! I really like the sentiment on the first card! Your cards are sooo cute! These cards are so sweet. Love the subtle colours you used and the googly eyes on the bears look brilliant! Really cute cards & I love the stamping on patterned paper. Thanks for a chance to win. Beautiful cards!!! I love the color choices. Super cute cards - love the bears with the googly eyes. Thanks for the tip on the mirror image of those cute bears! I love the polka dots! I adore the mirror image and googlie eyes! Great cards, I love the look of them! Thanks for sharing. Your Hero arts cards are so very sweet. i love the pastel colors and sentiments! Darling contributions Lucy to the Hero hop! You're style is so distinctive. 2 wonderful cards. Love your sparkle! I love the sentiment on the first card with the pretty background. The second image is so cute -- love the google eyes! Sweet cards the cuteness meter is really buzzing here. You rock this blog hop, Lucy! Love seeing your takes on these awesome stamps! Wish you and family a very Merry Christmas and happy, exciting new year!! Wow, you gals are really rocking this Hop. Love the cards. I must buy What a Hoot!!! Those bears are darling! So sweet! I love the thick glitter on the letters of the first card! Soooo cute Lucy! I love the new Hero Arts stamps! Thanks for all the inspiration! Gorgeous use of a stamp - mirroring it. Great cards! I really like your little bears with the googly eyes! Both cards are absolutely delightful, I love your use of ribbon and the tangled twine. very creative. great sentiments and just perfect use of patterned paper. Love the cards. Gorgeous use of patterned papers. I love it! Darling daughter and I both said "awwwww"! We love these cards. Thank you for sharing with us. Gotta have that sentiment especially after sseing what you've done with it and the Lil Hoot card is darling. Very cute cards. The first one is my favourite as I love butterflies. What cute cards, just love them. Thanks for the creative ideas! Great cards I love that little hoot set. You've showcased these new stamps beautifully!! These are great...but my favorite part are the polka dot bears!!! What sweet design! Your cards alway make me smile. Very nice! I especially like how you tied in the little butterfly on the stamped image to the butterfly paper on the card. Oh my goodness. That first card is so cool. I love the dimension of the rock candy. And that second card is just too adorable. I love the new stamp sets and your cards are adorable! Like the Butterflies, stitching & sweet Bear card. Cute! Love the google eyes! These are both so cute and clever. The reverse stamping turned out really well and is a great idea! Both cards are adorable and fun! Nice photos, too, showing off the yummy details of stitching, Stickles and googly eyes. Thanks for the tip on stamping a mirror image-looking forward to trying that technique. Great cards. Love the butterfly one. GORGEOUS cards! LOVE the first one - so beautiful! And your little matching mirror image bears are as cute as can be!!! The bears are adorable, love both of your cards!!!! I love the stamp "You are one of my nicest thoughts...Such a pretty card! Your cards are so beautifully made. I love my rock candy sticklers too!